When the Terlatos first became involved with the estate, they recognized that to make unique wines of exceptional quality, the estate's world-class vineyards would require a winemaking facility of equal caliber. 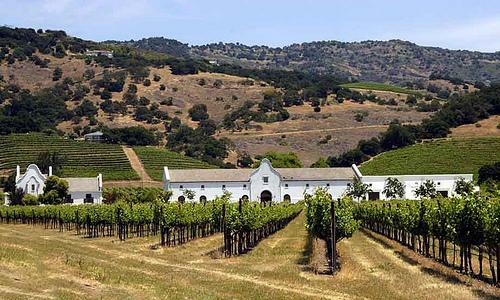 Accordingly, in 2002, they dedicated significant resources toward building a state-of-the-art winery. This new winemaking facility offers our winemaking team the ability to ferment each and every vineyard block separately, while also conducting small-lot experiments to fine-tune and further express the true spirit of the Chimney Rock estate. The accompanying climate-controlled barrel rooms allow for long-term aging of Chimney Rock wines in French oak barrels at the ideal temperature and humidity. What starts in the vineyard comes to fruition in the winery. Winemaker Elizabeth Vianna is deeply cognizant and intimately familiar with the estate's vineyards and she fully captures the estate's unique terroir through meticulous vineyard management and careful, artistically minimal winemaking principles. This "non-interventionist" style of winemaking allows the winemaker to fully utilize that which this wonderful and unique Stags Leap soil is capable of delivering. The end result offers wines that are pristine and authentic in terms of varietal character, accompanied by a velvety taste in the mouth and astounding softness, balance, and cohesion. Inky purple red. Aromas of black currant, licorice, along with hints of clove and vanilla. This wine is silky smooth, with a deeply structured backbone of fine grain tannins and a long bright finish. Wine Enthusiast 94 "Chewy tannins surround an elegant, structured wine, classic in red cassis, licorice and woody herbs. Powerful, it retains balance from start to finish, exuding the warmth of the vintage with the relative coolness of the appellation, marrying the two sides expertly together." Wine & Spirits 90"There's a bright cherry ping in the center of this wine, surrounded if not completely hidden within the tannin's fine-ground espresso roast flavor. The tannin is simple and delicious, a long, black line to connect it with braised short ribs. " Wine Spectator 90"Smooth and generous, an open-knit style with rich currant, plum and black cherry fruit that’s well-centered. The tannins are fleshy and elegant, leading to a long, flavorful aftertaste. Best from 2006 through 2012." Wine Spectator 92"An explosively rich and complex wine that reveals a ripe, vibrant, zesty core of wild berry and blackberry fruit, with pretty hazelnut and pine nut shadings and ripe, supple tannins that sail on the finish. Drink now through 2010. 2,200 cases made. (JL)"